Im gonna try to keep this short tonight because its getting late and I need to get some sleep. After all I only got 8 hour last night. Ha! Its been a while since I actually got in bed on time and it took an upset stomach to get there. I am feeling much better today. I did my early morning spin class today and 30 minutes on the elliptical. I was doing a kind of active recovery today. Make sure and keep my body moving but not really pushing all that hard. Luckily, the spin class was not too intense this morning. Sometimes it is killer and sometimes it makes for a great workout right after a long run. I can honestly say I am not as sore as I thought I would be. I am having a little bit of a cramping issue today. My calves starting cramping during my run yesterday and spastically throughout the day today they are seizing up. Im happy to say they are not "Charlie Horses" yet, and lets hope they don't become them. I get sidetracked, thats why my post are too long! I did get a little treat at lunch today. I treated myself to a pedicure. I have been begging my dad for a leg rub for days and he wont help me out so I am now having to pay for a leg rub! This is why you get married: weed eating and leg rubs! His name is Peter and Im thinking about going back tomorrow for another. After work I had to run so many errands and and I had a ballgame and had to get in another workout. I really thought I was going to get home around 8:15 and it was more like 9:15. It was a later than normal dinner but at least I got dinner tonight. I was hungry today so I gladly at at 9pm. My evening workout was a trip to the pool. Remember, active recovery! I got a mile in tonight and it was one of my best. I was not a PR by any stretch but it was easier than it has been. I swim in quarter mile splits with breaks, but tonight I did the middle half with no break at all and kept a pretty good pace. Active recovery- success! 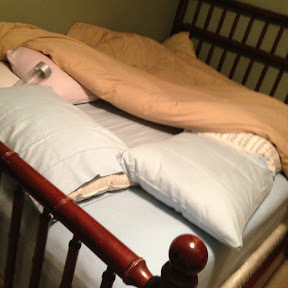 Once home I got all my household chores done and got fresh sheets on the bed since I slept nasty last night.